Located on Sukhumvit 41, Adelphi Grande is less than 10 minutes’ walk from Phrom Phong BTS Skytrain station. It features an outdoor pool, a restaurant and a fitness centre. Adelphi Grande Bangkok is around 45 minutes’ drive from Suvarnabhumi International Airport. It is within walking distance of Emporium and EmQuartier Shopping Centre. Guests can also check out Terminal 21, located only 1 BTS Skytrain stop away. Offering fantastic views of Bangkok, the spacious studios and suites at Adelphi Bangkok come with kitchenettes and living areas. Amenities include a flat-screen TV, a DVD player and free Wi-Fi. Adelphi Grande Bangkok has a business centre and a 24-hour front desk. It provides car rental, laundry and dry cleaning services. Boasting modern indoor and outdoor seating areas, Café Grande serves international buffet breakfast daily. Refreshing drinks and cocktails can be enjoyed until 17:00 hrs at the pool bar. Please note that guests booking 5-9 rooms will be charged a 10% deposit at the time of booking. Guests booking 10 rooms or more will be charged a 20% deposit at the time of booking. This payment is non-refundable and non-transferable. Please inform Adelphi Grande Sukhumvit in advance of your expected arrival time. You can use the Special Requests box when booking, or contact the property directly with the contact details provided in your confirmation. Guests are required to show a photo identification and credit card upon check-in. Please note that all Special Requests are subject to availability and additional charges may apply. 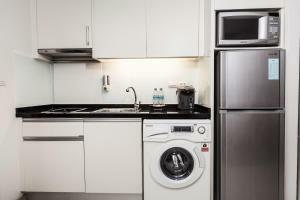 Room features a kitchenette, a flat-screen cable TV with a DVD player and a safety deposit box. A bathtub is included in an en suite bathroom. Rate: THB 3099.00 ... THB 11549.50; select dates below to get current rates. Spacious room features comfortable sofa set and ample work space. Its en suite bathroom is complete with a bathtub. Rate: THB 3385.67 ... THB 6848.00; select dates below to get current rates. Features 2 flat-screen TVs, separate living area, spacious bathroom with bathtub and separate rain shower cubicle. Features 2 flat-screen TVs, floor-to-ceiling windows, separate living area, spacious bathroom with bathtub and separate rain shower cubicle. This family room features a bathrobe, air conditioning and DVD player. Offering a double bed and a rollaway bed, this room has a satellite TV, kitchenware and minibar. This suite features a balcony, tile/marble floor and minibar. Please note that this room comes with a double bed and a rollaway bed.